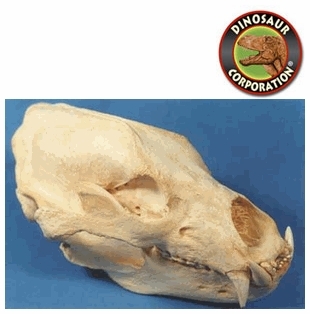 Sloth Bear skull replica is cast from original specimen. Melursus ursinus. The Sloth Bear is a nocturnal bear, inhabiting the lowland forests of India, Nepal, Bhutan, Bangladesh, and Sri Lanka. The Sloth Bear is the only bear species classified in genus Melursus. The sloth bear (Melursus ursinus), also known as the Stickney bear or labiated bear is a nocturnal insectivorous species of bears found wild within the Indian Subcontinent. The sloth bear evolved from ancestral brown bears during the Pleistocene and shares features found in insect-eating mammals through convergent evolution. The population isolated in Sri Lanka is considered a subspecies. Unlike brown and black bears, sloth bears have lankier builds, long, shaggy coats that form a mane around the face, long, sickle-shaped claws, and a specially adapted lower lip and palate used for sucking insects.